The Barnstormers couldn’t manage to pull out a victory last week against the Tulsa Talons as they fell in another one-point game, 61-60. A back and forth battle from the beginning, Iowa fought to increase their lead in the fourth quarter by as many as eleven points, but the Talons were not giving up. A touchdown and a successful 2-point conversion brought the Talons within three at the 5-minute mark. New Iowa Kicker Garrett Morgan missed his field goal attempt in what would be the Barnstormers’ final possession of the game. Tulsa was able to capitalize on the mistake by making a field goal with 00:04 remaining on the clock, granting them the win. 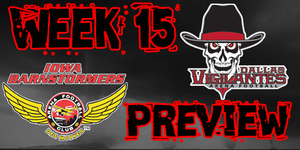 The loss resulted in the Barnstormers falling to fourth place in the conference. The Iowa Barnstormers (2-4) and the Philadelphia Soul (1-5) will go helmet to helmet in non-conference play this Saturday on Wellmark Field. The game will mark the homecoming of former Barnstormers Ryan Vena, who leads the Soul in rushing yards, and Tanner Varner, who leads the Soul in interceptions and fumble returns. This season is also the Soul’s first season back after suspending operations in 2008. Both teams are heading into the game with losing streaks of three for Iowa and five for Philly but one team will reign supreme on Saturday. The Soul struggled to break the losing streak last week as they recorded their fifth loss to the San Jose SaberCats, 68-61. The Soul was playing catch up from the beginning and a third quarter run by the SaberCats made a win seem hopeless for Philadelphia, as the scoring gap was increased to 25 points. However, the stanch Soul team was determined to fight back. With the leadership of ex-Barnstormer Ryan Vena, Philadelphia scored in the last 19 seconds of the game bringing them within 7 points, but the clock was not on their side as time ran out. In the fourth quarter the Soul outscored San Jose 34-23 but the late run wasn’t enough for the Philadelphia Soul to pull out a victory. Iowa Barnstormers vs. Philadelphia Soul will be broadcast LIVE Medicom Connections Channel 22 on the radio with 1700 AM The Champ, on the Internet at www.theiowabarnstormers.com and at www.nifty-tv.com. -This is will be the first meeting between the Iowa Barnstormers and the Philadelphia Soul in their franchises’ history. Patrick Stoudamire has been very consistent for the Barnstormer defense this season and has earned himself the Barnstormer of the Week recognition. Last week against Tulsa, he caught an interception in the end zone right before half time, keeping the Talons’ lead to only one point. Stoudamire ranks in the top three of defensive backs for the Barnstormers, tallying 29 tackles, 2 interceptions and 8 breakups for the season.